Now that all the slots have been filled it's time to 1) say thank you again to those who signed up to participate and 2) randomize the unclaimed teams and assign them to each slot. As with in the past, trading is encouraged...just please post your trades somewhere public so that I know. I'd hate to send the wrong cards to the wrong person! 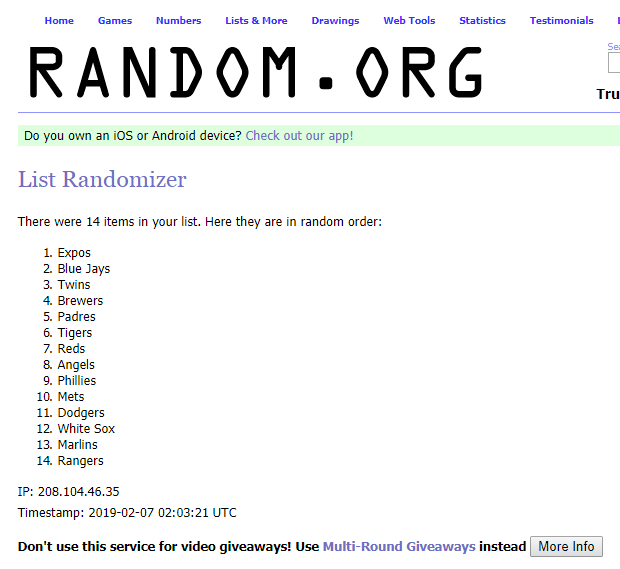 So now let's take the teams that went unclaimed and load them into the list randomizer on Random.org and we'll see which teams go to which participants. Teams will be assigned in the order of this list, so the first team will go to me and the last team will go to Bulldog. Got it? Alright, trading is open! Again, just make sure I know once your trade is confirmed so I can update it on my end and make sure you get the proper cards! See everyone on Twitter (@flywheels) Saturday night at 9 PM Eastern. 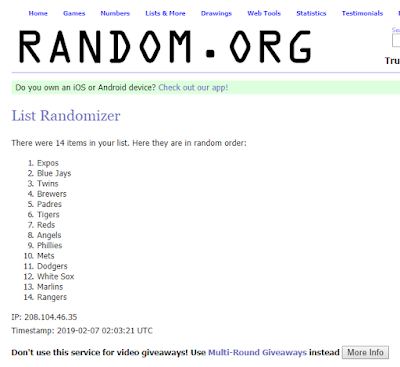 Wade - interested in a Rangers for Angels swap? Nick - interested in trading the Twins? I will trade Angels for Rangers, if it's not too late. Sounds good. Colbey - is that good with you?